Get your feet wet in the galleries, with an architectural showcase straight from Venice. The Pool: Architecture, Culture and Identity, exhibition by Aileen Sage Architects (Isabelle Toland and Amelia Holliday) with Michelle Tabet, commissioned for the Australian Pavilion by the Australian Institute of Architects for the Venice Biennale of Architecture 2016. The design gallery at the National Gallery of Victoria has undergone what is perhaps its most unexpected transformation yet. Thanks to an installation called The Pool: Architecture, Culture & Identity, the gallery space has become an 11-metre-long pool, complete with decking and bleachers. And yes, you’re allowed to dip your toes in. The installation first appeared at the 2016 Venice Architecture Biennale, where it attracted more than 100,000 visitors. Presented by the Australian Institute of Architects and curated by Sydney-based practice Aileen Sage Architects (Isabelle Toland and Amelia Holliday) in collaboration with urban strategist Michelle Tabet, the installation explores Australian identity through the humble and ubiquitous swimming pool. Although it is steeped in Australiana, The Pool hasn’t been exhibited here before. 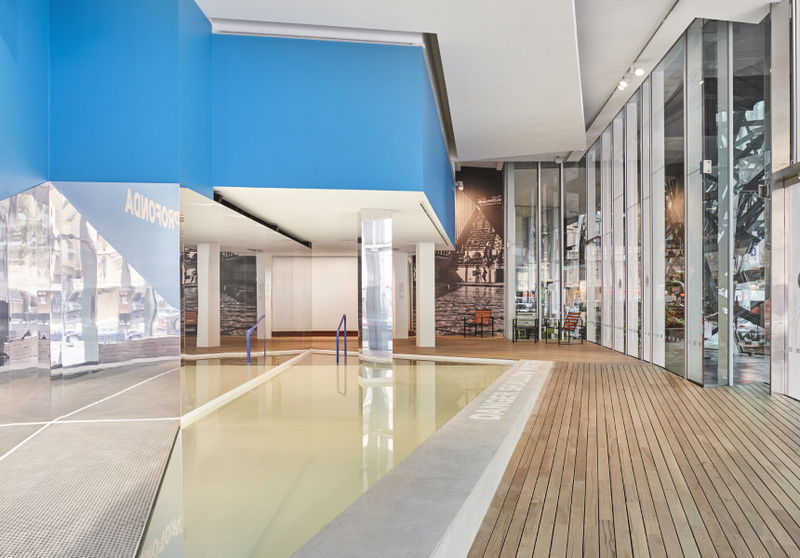 Ewan McEoin, senior curator in the NGV’s Department of Contemporary Design and Architecture, saw The Pool in Venice last year and thought it “bridged architecture and broader cultural conversation in Australia about the built environment”. The NGV has installed the exhibition as it was – although has changed its shape to suit the gallery space – and has added “some extra elements that weren’t at Venice to make it more of an immersive, multi-media and multi-sensory space”, McEoin explains. These extra elements include a series of films about different iconic pools around the country, such as the Fitzroy Baths in Melbourne, Bondi Icebergs in Sydney and a number of residential pools from the homes of prominent Australian personalities. 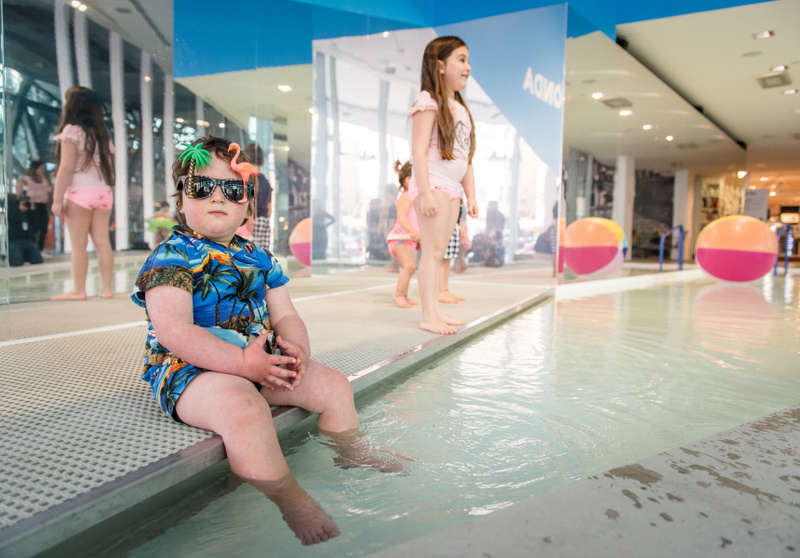 As visitors walk around the installation, they’ll also hear perspectives and stories from eight famous Australians including Olympians, writers, environmentalists and fashion designers, about how swimming pools fit into our culture. One is author Christos Tsiolkas, whose novel Barracuda (he also wrote the bestseller The Slap) is about a swimming prodigy. He talks about pools “in a multi-cultural sense – how it became part of [his] life in the backyard. Whereas Paul Kelly talks about it as a travelling musician – visiting different watering holes in the country,” McEoin says. To round out the multi-sensory experience, a scent has been custom-made for the exhibition by Maison Balzac in collaboration with Sydney-based artist duo Lyn & Tony. “It’s quite a beautiful exhibit … and people can take off their shoes and socks and walk in the water." 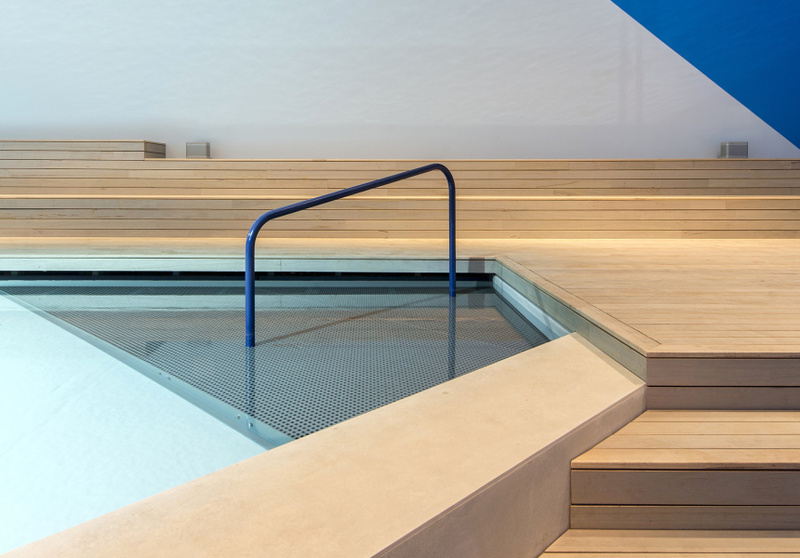 The NGV has worked with pool engineers to ensure it stays clean over the six months. The Pool: Architecture, Culture and Identity *is showing at The Ian Potter Centre: NGV Australia from August 18 2017 to February, 2018. Entry is free. More information here. This article was updated on September 1, 2017.